The Award Winning American Hustle Arrives on Blu-ray March 18! A fictional film set in the alluring world of one of the most stunning scandals to rock our nation, American Hustle tells the story of brilliant con man Irving Rosenfeld (Bale), who along with his equally cunning and seductive British partner Sydney Prosser (Adams) is forced to work for a wild FBI agent Richie DiMaso (Cooper). DiMaso pushes them into a world of Jersey powerbrokers and mafia that's as dangerous as it is enchanting. Renner plays Carmine Polito, the passionate, volatile, New Jersey political operator caught between the con-artists and Feds. Irving's unpredictable wife Rosalyn (Lawrence) could be the one to pull the thread that brings the entire world crashing down. Like David O. Russell's previous films (The Fighter, Silver Linings Playbook), American Hustle defies genre, hinging on raw emotion, and life and death stakes. Christian Bale, Bradley Cooper, Amy Adams, Jeremy Renner, Jennifer Lawrence & Louis C.K. CULVER CITY, Calif. (Feb. 3, 2014) -- Nominated for 10 Academy Awards and winner of three Golden Globes, the critically acclaimed, genre-defying American Hustle will be available on Blu-ray Combo Pack, DVD and Digital HD UltraViolet March 18 from Sony Pictures Home Entertainment. Mastered in 4K, American Hustle tells the story of a pair of brilliant con artists forced to work with an FBI agent on a case that ultimately erupts into one of the most stunning scandals to rock our nation. The film is co-written and directed by three-time Oscar-nominated David O. Russell and stars Academy Award winner Christian Bale, two-time Academy Award nominee Bradley Cooper, five time Academy Award nominee Amy Adams, two-time Academy Award nominee Jeremy Renner, Emmy and Grammy winner Louis C.K. and Academy Award winner Jennifer Lawrence. The all-star cast also won a Screen Actors Guild Award for Outstanding Performance by a Cast in a Motion Picture. 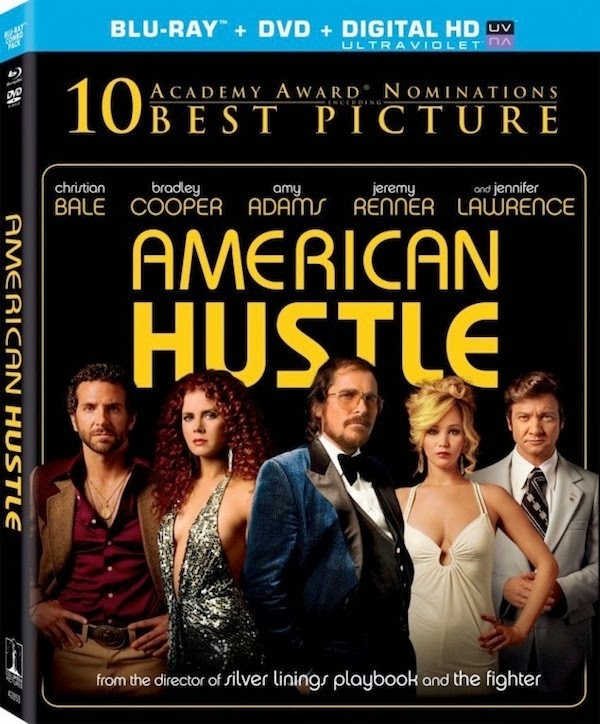 Blu-ray and DVD bonus materials include “The Making of American Hustle,” a behind-the-scenes featurette with filmmakers and cast introducing the dazzling world of American Hustle and explaining why they were captivated by the story and its characters. Also included are more than 20 minutes of deleted and extended scenes from the cutting room floor.